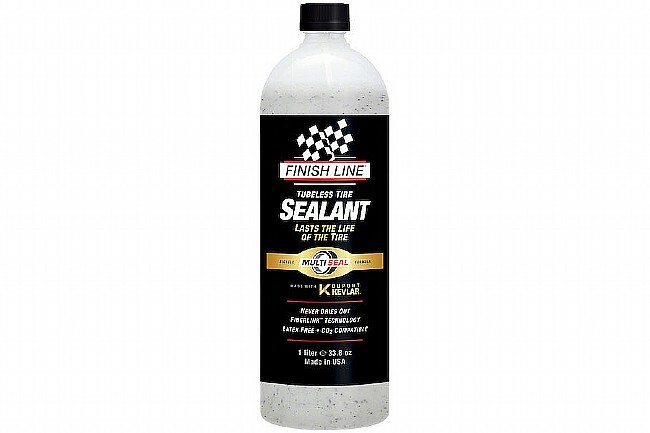 The Finish Line Fiberlink Tubeless Tire Sealant will not cure inside the tires, therefore, it doesn’t need to be refreshed every few months to maintain effectiveness. This sealant will last the entire usable life of the tire. Since there is no liquid latex or ammonia in Finish Line sealant, it is naturally non-toxic, hypoallergenic and safe for carbon fiber rims. Additionally, Finish Line Tubeless Tire Sealant cleans up easily with water – no more scrubbing or scraping cured latex from tires and rims. Non-latex ammonia-free formulated tubeless tire sealant. Kevlar reinforced Fiberlink mesh seal. Seals up to 1/4" punctures. Can be used in cold temperature, down to -10º F.
Bought this as I liked the idea that it doesnt dry out like out Stans. Put it in with a fresh pair of Schwalbe Pro One 23mms. After approximately 300 miles I experienced my first flat, heard the hissing. Didnt seal on its own, I stopped rotated the tire and it sealed initially after losing what felt to be 10psi. Rode on for a few miles and the tire felt a bit softer, added some co2. About 10 miles later I was spraying sealant and losing psi, had to throw a tube in. Cut on the tire was on the top approx 2mm slice, sealant should have easily sealed that up, pretty dissatisfied. Did not seal punctures on both a gravel tire and mtb tire. Mounted a new set of Continental Race Kings which can be challenging to seal and could never get the bead to seal with this stuff. Stans sealed no problem. This sealant doesnt dry out like they say but its too thick and just coats the inside of the tire like slime and leaves nothing left to seal a puncture. I have ridden 4 years exclusively tubeless both road and MTB, so this review comes from some one with experience. Didn't seal at the bead on Easton Road Tubeless rim with Hutchison Sector 28 . Didn't Seal with DT Swiss XCM 1200 with Hans Damphf . Never had issues with Stan's. I was really excited to try this product, because it sounded too good to be true. It really was. The concept makes a lot of sense, but for road tubeless it just doesn't work. I've tried it on 4 different tubeless tires and it (1) rarely plugs any puncture (large or small), and (2) makes it incredibly tough to get tires to seal. Really disappointed. I have this sealant in my MTB, gravel bike, and now road bike. Love that it doesn't need to be replaced because it won't dry out. I also like that I no longer have to clean up the sticky residue of dried up tubeless sealant on the rim seats.